...I just have a hunch. Anyways, hello guys, Â Shawn here. I was sick during this podcast so Rocco, Derrick and Garrett try to get along without me. They talk about Zero Dark Thirty and all the hot new games they have been playing! 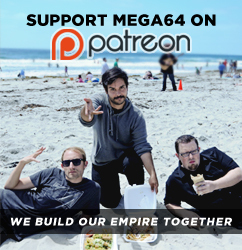 Plus, Mega64 is involved in a DRAMA BOMB with potential Grammy performers!!!! We dish all the dirt! It's getting NASTY!Â Listen to it all go down here! Sorry it was a little late, I have been struck with a dumb cold. To make up for it, we will be putting a new video out any minute! Check back as soon as you can to see it, and try to figure out what I am saying with this stuffed up nose!